Molecular biology is undergoing exponential growth in both the volume and complexity of biological dataand knowledge discovery offers the capacity to automate complex search and data analysis tasks. This book presents a vast overview of the most recent developments on techniques and approaches in the field of biological knowledge discovery and data mining (KDD)providing in-depth fundamental and technical field information on the most important topics encountered. 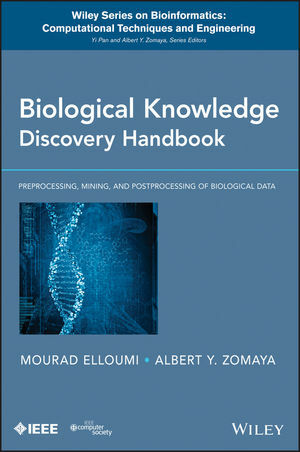 Written by top experts, Biological Knowledge Discovery Handbook: Preprocessing, Mining, and Postprocessing of Biological Data covers the three main phases of knowledge discovery (data preprocessing, data processingalso known as data miningand data postprocessing) and analyzes both verification systems and discovery systems. Combining sound theory with practical applications in molecular biology, Biological Knowledge Discovery Handbook is ideal for courses in bioinformatics and biological KDD as well as for practitioners and professional researchers in computer science, life science, and mathematics. MOURAD ELLOUMI is a Full Professor in Computer Science at the University of Tunis-El Manar, Tunisia. He is the author/coauthor of more than fifty publications in international journals and conference proceedings and the coeditor, along with Albert Zomaya, of Algorithms in Computational Molecular Biology: Techniques, Approaches and Applications (Wiley). ALBERT Y. ZOMAYA is the Chair Professor of High Performance Computing & Networking at The University of Sydney's School of Information Technologies. He is the author/coauthor of seven books, more than 450 publications in technical journals and conference proceedings, and the editor of fourteen books and nineteen conference volumes. He is a Fellow of the IEEE, the American Association for the Advancement of Science, and IET (UK).